Bonn, 20 April 2018 - With their long downcurved bills and distinctive call (“cur-loo”), curlews are among the most recognizable of all wading birds. But these large, long-lived shorebirds are also among the most threatened migratory birds on Earth: Two of eight curlew species have not been seen for decades and, tragically, may well be extinct (the Eskimo and the Slender-billed Curlew). Another three (the Eurasian, the Bristle-thighed, and the Far Eastern) are listed as being of conservation concern on the IUCN Red List of Threatened Species. 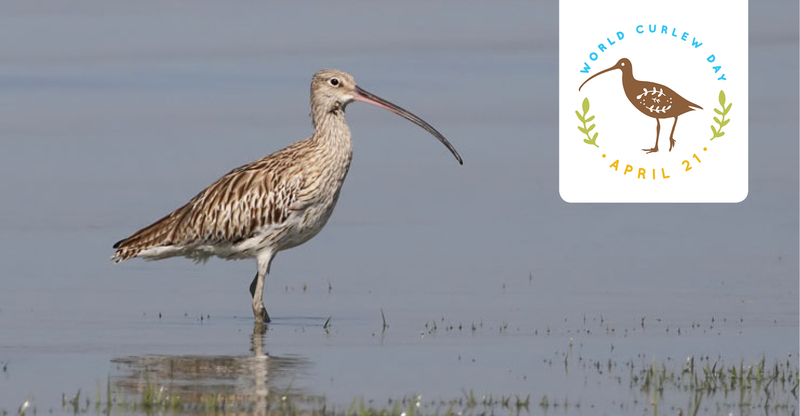 To be launched tomorrow, World Curlew Day is a grassroots initiative supported by environmental organizations such as BirdLife International and Wetlands International. It is a one-day global event aiming to raise awareness about the plight of curlews and to encourage activities to help them. Holding a public talk, organizing a curlew-themed art show, celebrating World Curlew Day at a local school—all such awareness-raising activities are welcome and all funds raised will go towards local or national curlew projects. The primary threat faced by curlews is habitat loss and degradation in the non-breeding areas, especially on the coasts of Asia. On the breeding grounds, change in land use is a particular problem for some species. Several curlew species are listed on the CMS and AEWA Appendices; the entire family Scolopacidae of shorebirds (which includes all species of curlew) is also listed under CMS Appendix II. These species benefit from activities to improve their conservation status. The Action Plan for Far Eastern Curlew was adopted at CMS COP12 in October 2017 in Manila. The Far Eastern Curlew population has declined by an estimated 80 per cent over the last 30 years; the Action Plan aims to return the population to a positive growth rate for at least three generations. Essential actions to achieve this include: identifying and managing a network of protected sites, reducing illegal harvesting and incidental bycatch, and monitoring the species’ population trend. The Eurasian Curlew is the focus of an International Single Species Action Plan under AEWA. The Action Plan ultimately aims to restore the AEWA populations of the Eurasian Curlew to a favourable conservation status. Priority areas of action include: conserving important breeding and non-breeding habitats, increasing breeding success, maximizing juvenile and adult survival, and addressing key knowledge gaps. CMS Appendix I covers migratory species that have been assessed as being in danger of extinction throughout all or a significant portion of their range. Appendix II covers migratory species that have an unfavourable conservation status that require, or would significantly benefit from, an international agreement for their conservation and management.